I have done small changes to the game based on the feedback. Blocks doesn't move fast at the beginning, but goes faster on every level. Object randomizing speed is also reduced a bit. When player gets immortality for five seconds, player box is blinking one second to notify that immortality is going to end soon. New version was uploaded today to Google Play store. I'm looking for beta testers for my game called Catventures. 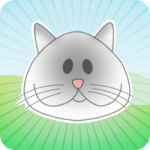 Catventures is an endless runner game for the kids: "You are a cute kitty in amazing adventure away from home. When running in a field, kitty is catching up the butterflies and avoiding non-friendly dogs and other traps. Game control is easy, just touch the screen to jump: longer you touch, higher the cat jumps! There are hidden games in a game: catch a star or fish to play! How far you can run?" From beta testers I would like to receive feedback about bugs (there are bugs, I know some already) and the ideas how to improve the game. Here's beta gameplay demo in Youtube: Please join first to Catventures Google community:https://plus.google.com/u/0/communities/107399757716487350157?cfem=1 Then you are able to download game from Google Play Store: https://play.google.com/apps/testing/net.rasteri.catventures If the link doesn't work, please PM your Google gmail address to me and I will add you to the Catventures Beta testers group. Game is made with Construct 2, build is done in Cocoon.io. There's now new version available in Google Play Store: Collect yellow block to get 5 seconds of immortality! That's good to hear! I have some ideas to make it better, so there will be more updates coming. It's now submitted to Amazon Appstore, so it will be available there soon. I'm planning to get it also to Windows Phone Store during upcoming weeks. Was Flappy Bird too easy? Then try this addictive game and try to survive as long as you can: https://www.youtube.com/watch?v=BIvAZ786Aj4 On this addictive game you need to survive as long as you can by jumping over the blocks. Every time player jumps, the gravity changes making this more challenging than regular endless running games! Game requires fast reaction time and also good luck. Games specs:-Retro graphics.-Adrenaline music.-Easy to control, just touch the screen to jump. Available at Google Play Store:https://play.google.com/store/apps/details?id=net.rasteri.mixedgravity Mixed Gravity is now available for Windows Phone: https://www.microsoft.com/en-us/store/apps/mixed-gravity/9wzdncrd25xr Available for iOS: https://itunes.apple.com/app/id1004654564 This game was done by using Construct 2 and exported to Crosswalk project. Android APK was build by using Intel XDK.